Growing up, I was very close to my paternal grandmother. She was widowed young and filled her life with a cohort of doughty female friends and relations. They became, by extension, my ‘aunties’. They played whist, shopped and shored up the Women’s Royal Voluntary Service together. As time passed they all started to break bones, usually hips. So visiting rosters were set up and we trooped off to see each one, in hospital or convalescent homes. That was over 40 years ago but, even today, fractures are the number one cause of hospitalisation for women over 55. Our bones have extraordinary power to remodel and rebuild themselves. In our twenties they are constantly renewed: damage by wear and tear is repaired so the bones remain strong. But as we age, the balance tips, our bones aren’t rebuilt at the same rate and they start to weaken, a condition known as sarcopeia. Their structure becomes increasingly ‘honeycombed’- holey and sponge-like. When that process becomes extreme, osteoporosis (literally: porous bones) can be diagnosed. These weakened bones are more likely to fracture, particularly at the hip, spine and ankle. There’s a lot we can do to protect our bones from the ageing process. Making sure we get an adequate supply of calcium in our diet is the most obvious. But it’s not as simple as just popping a pill. Research from the US shows that our bones absorb dietary calcium better than that from supplements. Dietary calcium doesn’t have to come from dairy products. Sardines (with the bones in) provide a hefty whack of calcium. We love them on toast for a quick and thrifty lunch. And it’s perfectly possible to get all the calcium we need from plant sources. It finds its way into plants from the earth, ending up in dairy products because cows eat plants! The calcium in plants is easier for our bodies to absorb than that in milk. Brassicas (also known as crucificerous vegetables) like bok choi, kale and broccoli are rich in the mineral too. In fact, vegetables could be your bones’ new best friends. Australian research found that women over 55 who ate more vegetables were less likely to be hospitalised with a fracture. It’s that simple. The correlation was particularly strong with consumption of brassicas and alliums (onions, leeks, garlic etc). The research team aren’t exactly sure why this happens, but they suggest it may be because these vegetables contain many nutrients which work with calcium to build strong bones. For example, brassicas are also a good source of Vitamin K, which has been linked to a lower incidence of hip fracture. In addition, phytochemicals (biologically active compounds found in plants) help the bones fight damage from free radicals. The researchers were particularly interested in phytochemicals found in both cruciferous and allium vegetables called organosulfur compounds. One of them, sulforaphane, has been shown to help build strong bones. So don’t knock that slightly whiffy, sulphurous smell that comes from cooking cabbage and onions, it’s helping to reduce your fracture risk! This week’s recipe is packed with brassicas and alliums. We love the more traditional versions of shakshuka, with eggs baked in a rich tomato sauce. This one is a little different. It relies on green vegetables, plus leeks and onions, to provide a base. The veg are all held together with a vivid green puree (a savoury smoothie, essentially). Sounds weird, but it works! This makes a great brunch for four people, served with toast, or a supper for two. Cut the onions in to thin half moons, and halve the leeks, lengthways. Shred the halved leeks into half-centimetre slices horizontally. Heat the oil in a large, wide saute pan with a lid. Add the onion and leeks. Allow to soften in the oil on a low heat, until translucent but not coloured. Add the garlic and cook for a minute more. Meanwhile, whizz up all the puree ingredients in a food processor (I use my NutriBullet). You’ll end up with a bright green puree. Tip it into the pan, along with the broccoli florets. Cook for a couple of minutes, covered, until the florets start to soften. Add the kale and allow it to wilt. Add a splash more water if the pan is looking dry and the veg is starting to stick. 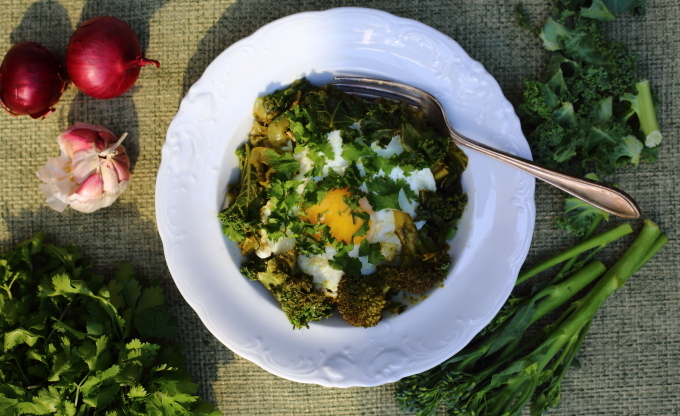 Make four small wells among the kale and crack an egg into each. Cook over a gentle heat until the egg whites are set but the yolks are still runny. Season to taste and serve immediately with more coriander sprinkled over.